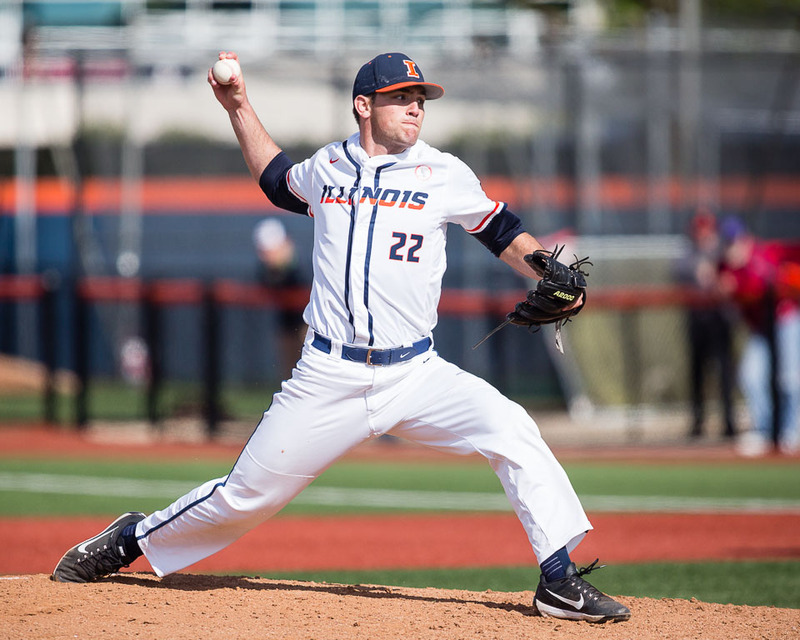 Illinois starting pitcher Cyrillo Watson (22) delivers a pitch against Maryland at Illinois Field on Saturday, May 6. 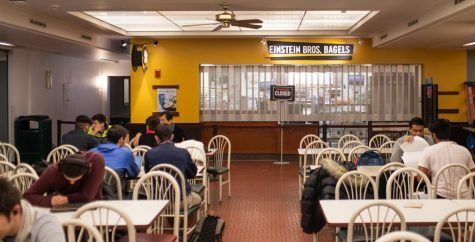 Buzzer-beaters are pretty common in basketball, hockey and maybe even football. 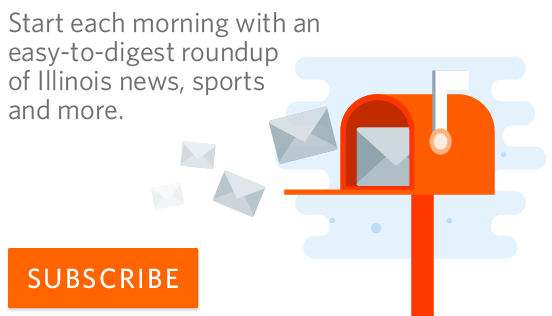 But, a “buzzer-beater” in baseball is almost unheard of. 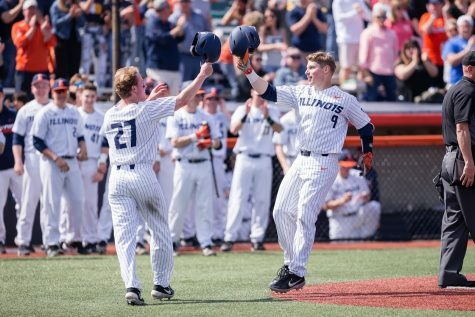 However, that is exactly what Mark Skonieczny and the Illinois baseball team did Sunday afternoon as he hit a walk off two-run home run to win the game in the bottom of the ninth inning, just minutes before the travel drop time that was set before the game. 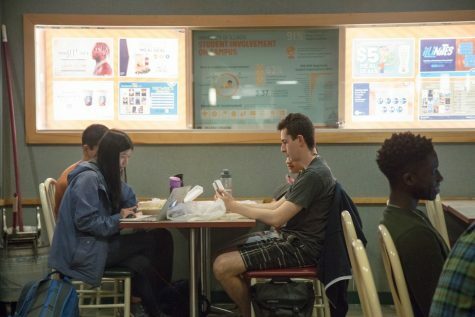 No matter the result of the bottom half of the ninth, that would have been the last inning. 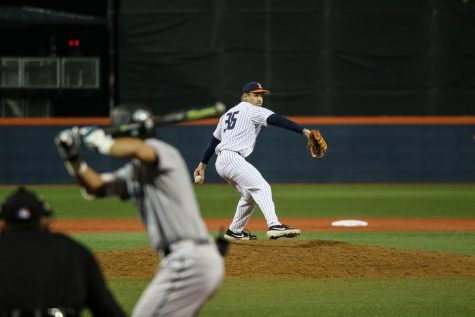 After blowing a save in the top of the ninth inning, the Illini had lost any momentum they had from earlier in the game. But, following a leadoff walk and a slew of defensive changes from Maryland, Skonieczny won the game and the series in the last possible moment. 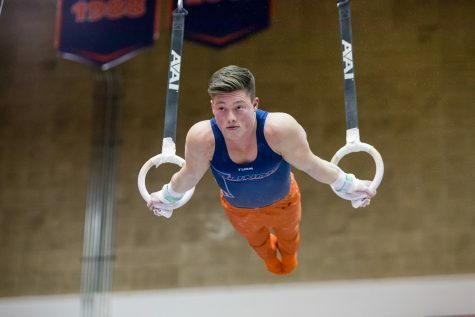 The Illini knew how big the game was and got off to a quick start. They grabbed the lead in the second after two-time reigning Big Ten Freshman of the Week Michael Massey led off the inning with a solo-shot over the right field wall to go up 1-0. 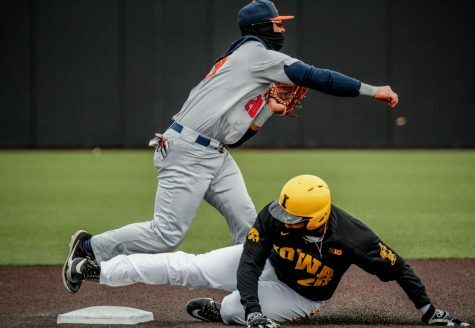 Neither team scored in the third or fourth innings, but the Illini capitalized on a mistake from Maryland pitcher Taylor Bloom in the fifth. 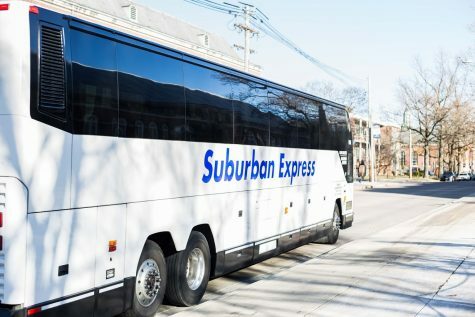 After getting the first out, Bloom hit center fielder Doran Turchin to put a runner on, which was followed by a perfectly executed hit-and-run by Jack Yalowitz that advanced Turchin to third before he was knocked in on a single by Ben Troike. Yalowitz also went on to score after first baseman Pat McInerney ripped a single to left, knocking Bloom out of the game and bringing in the Terrapins’ first reliever, Ryan Hill. Massey continued the big fifth with a sac-fly to center that scored Troike — extending the Illini lead to four. 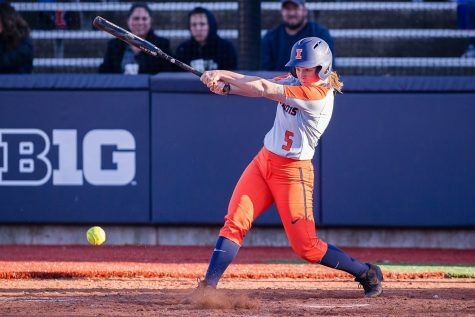 The top of the sixth brought the Illini a scare, as Yalowitz made a head-first dive into the chain-link fence in right field going full speed. Head coach Dan Hartleb and the team trainer took a trip out to right with a towel before Yalowitz eventually exited the game. Tyler Engel replaced Yalowitz in the outfield. Maryland followed up the incident with its first score of the game off of a solo shot from Terrapin designated hitter Will Watson. Senior starter Matthew James exited the game in the top of the seventh after putting runners on first and third. James went six innings, allowing just two runs and recording six strikeouts — a career-high. Lefty Zak Devermann came on in relief. Devermann threw just one pitch but induced a pop-up bunt to record the first out and keep the runners on first and third before pitching coach Drew Dickinson made the call to bring in Ryan Thompson to finish the inning. Thompson grabbed a ground ball up the middle, but after recording the second out at second base, the throw to first was late, allowing Maryland to cut the lead to just two runs. Thompson got out of the inning with just one run allowed. 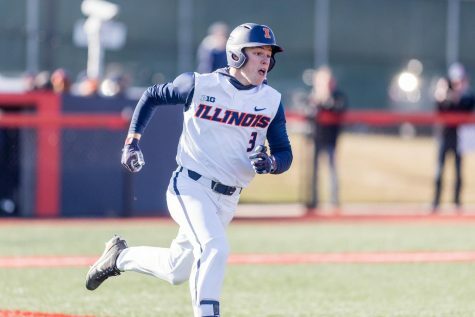 But, the Illini were quick to answer with two more runs of their own, coming on a two-run opposite field home run by McInerney to extend the lead back to four. Troike scored his second run of the game on the home run. 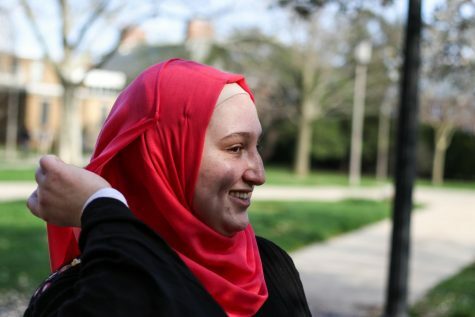 In the top of the eighth, the Illini got into some trouble. Thompson walked two batters and allowed a single, setting up the Terrapins with the bases loaded and just one out. 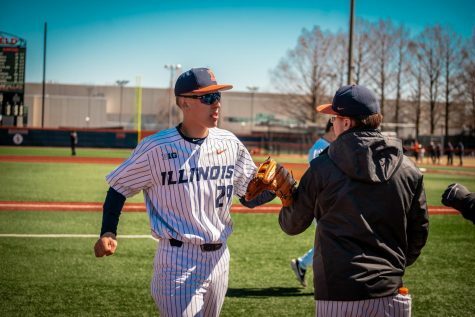 Illini closer Joey Gerber came in to replace him, recording back-to-back strikeouts to get out of the inning and preserve a four-run lead. 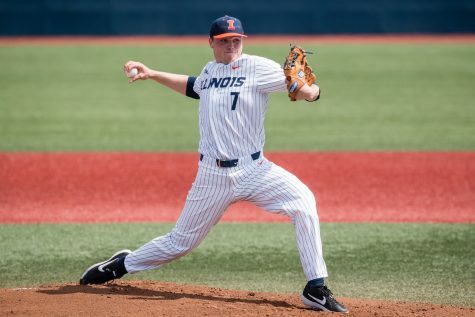 The Illini again got themselves into some trouble as Gerber walked the first two batters he faced in the top of the ninth. After a mound visit from his pitching coach, Gerber forced a ground ball to get the first out before striking out the next batter. But, that was followed by a two-out, two-run double that cut the lead to 6-4 and kept the Terrapins alive. That was followed by a game-tying two-run home run over the fence in right-center field. The home run was Watson’s second of the game. 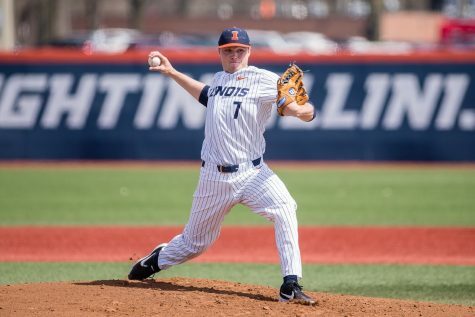 Gerber struck out the next batter to send the Illini into the bottom of the ninth with an opportunity to win it. With two outs and an 0-2 count, Skonieczny hit the game-winning home run to win the game and series. 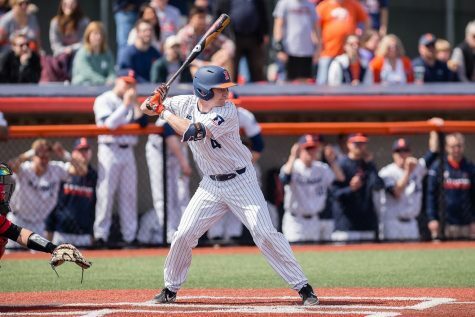 The series was a big one for the Illini, as they currently sit on the outside looking in at a spot in the Big Ten tournament. 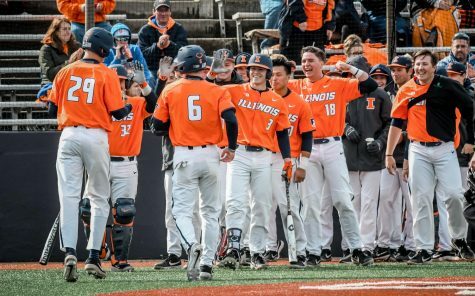 But, following a series win against the Big Ten-leading Terrapins, the Illini have greatly improved their chances of making a run and sneaking in to grab one of the final spots in the tournament. 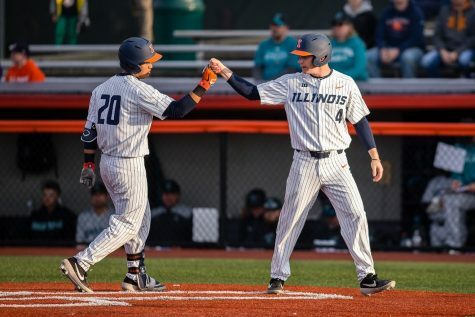 With just six games remaining in the season, the win Sunday may prove to be crucial in Illinois’ efforts to make a postseason run.